Spring may be just around the corner, but winter isn’t over yet. Those of us who work in comfortable indoor spaces are fortunate that we only experience the cold weather on our way to and from work. However, for the many who work outdoors, the weather presents a daily challenge, especially during winter. Workers in extremely cold outdoor conditions are typically aware of the hazards to health caused by exposure to cold, and most will take sensible precautions. But surprisingly, health risks start to increase at relatively mild cold-weather temperatures, even at 10°C, especially if conditions are also wet or windy. Prolonged exposure can cause workers to suffer from more colds, bronchitis and asthma, painful, stiff joints, and fatigue. In more extreme cases, they can suffer from frostbite or hypothermia, which is often difficult to spot until the sufferer actually collapses, and can lead to coma or death. Employers can’t control the weather, but they do have a legal responsibility to ensure their workers are properly trained and equipped for the conditions, and that strict safety procedures are in place. In any outdoor work environment, whatever the weather, risk assessments must be carried out by employers before work goes ahead; they should also consider if work should be rescheduled, what aspects can be done indoors, and whether or not extra employees can be hired to reduce amount of time each spends exposed to the cold. The employer must also provide a heated indoor space (cabin or trailer) for regular warm-up breaks that is easily accessible and includes warm food and drinks. Being cold and/or wet while working is not only uncomfortable, but it can affect mental judgement, which poses a serious risk to the safety of everyone on the site. It can also have serious, long-term effects on health and can be fatal in extreme cases. Workers should stop work immediately and talk to a supervisor if they find themselves exposed to extreme or long-term cold. The Occupational Safety and Health Administration (OSHA) has published guidance for protecting employees who must work outdoors in winter weather. 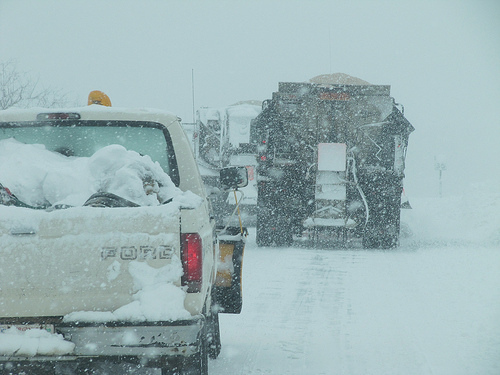 Click here for the OSHA Winter Weather web page and here to download a cold stress quickcard. Also see Jon Elliott's recent blog for detailed information about protecting employees who work outside in winter weather.